Sacramento enjoys an average of 269 sunny days each year. That makes it a great city for solar panels because panels work best when they are in direct sunlight. But what about the other 96 days of the year? That’s more than three month every year that Sacramento experiences dreary, drizzly and cloudy weather. Is it really worth investing in solar energy if you aren’t going to see the sun for more than ninety days every year? The short answer: absolutely. Solar panels are made to cope with less-than-perfect weather, but it’s important to understand how those cloudy days are going to affect your energy production and what you can do about it. Direct sunlight is going to allow your solar panels to create the most energy. However, solar panels do still produce energy on cloudy days, but it’s not going to be as much as you are probably used to on those sunnier days. On average, you can expect your solar panels to make about a quarter to a third of the amount of energy on those cloudy days, so you might want to plan ahead. How much energy they create will depend in large part on how dense the cloud cover is on those sunny days; if it’s partially cloudy and some sunlight is still peeking through, then you should still get a decent amount of energy. If the cloud cover is quite thick and you find yourself needing to turn on lights in the middle of the day, then there is a good chance that very little solar energy is being harnessed by your solar panels that day. It’s important to note that some cloud cover can actually be good for some solar panels. That’s because some panels won’t work as well when the mechanics inside become overheated, so a little protection from the hot sun could actually help keep your solar panels working harder for longer. That means it doesn’t necessarily have to be hot to make energy because it’s really the rays of the sun and not the heat that is doing the work. There is also a phenomenon where solar panels actually produce more energy on partially cloudy days because the clouds actually magnify the rays of the sun. So while total cloud cover can be a detriment, partial cloud cover could actually be doing you a favor and upping your energy production. If you are experiencing a string of cloudy days and don’t want to run up your energy bill using fossil-fueled energy production methods, then you might want to consider taking steps to temporarily reduce your energy usage until the sun comes back out again. Unplug any electronics that aren’t absolutely necessary that day. Remember, appliances still use a small amount of energy when they are plugged into the wall. The only way to prevent them from using any energy is to unplug them entirely. Skip running appliances like your dishwasher or clothes washer. You might want to handwash your dishes that day or wait until the next sunny day to do a load of laundry. Turn lights off when you exit a room. If you automate your home, motion sensors can detect when no one is using the room and turn off the lights for your automatically. When it comes to solar energy, it’s important to look at the big picture of electricity production. If your goal is to reduce your impact on the environment by utilizing a renewable energy source, you’ll still be doing that, even if you have to occasionally rely on traditional electrical generation to power your home. If your goal is to reduce your monthly energy bill, that’s still going to happen in cloudier months, too, although perhaps not by quite as much as during sunnier months. But when you consider the impact your solar energy is going to have on your home over the course of a year, it’s massive. A few cloudy days here and there shouldn’t cause you to rethink your plans to install solar panels on your Sacramento home. In fact, it’s often cloudier cities that embrace solar panels in bigger numbers. There is less correlation between sunny cities and solar panel rates; it has much more to do with how expensive energy is in that city. Because Sacramento energy rates can be quite high, more people embrace solar energy as a way to bring down their monthly energy bills. While their solar panels may not be producing at 100% efficiency all year long, it’s enough of an impact over the course of a year to make solar panels an affordable investment that ends up paying for itself. Ready to Have Solar Panels Installed on Your Home? 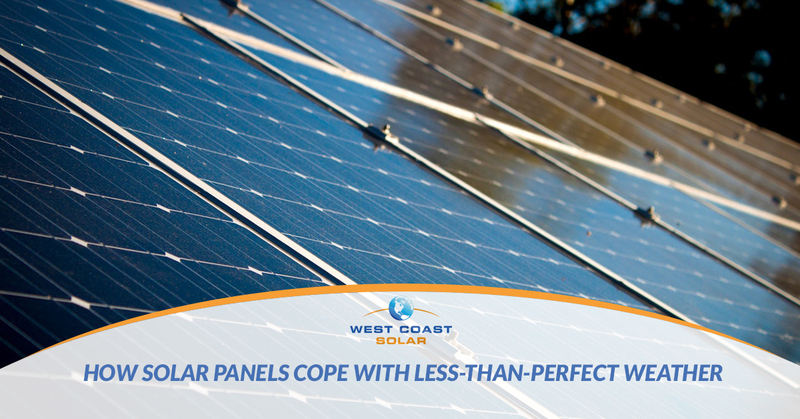 Get in touch with West Coast Solar. We carefully design and install solar panels for Sacramento homeowners and help them achieve their clean, renewable energy goals. Simply give us a call or contact us through our website to get a free estimate on having solar panels installed on your roof. Our team is happy to answer any questions that you might have about solar panels and make sure you have the information that you need in order to determine whether or not solar panels are the right energy choice for your home. Get started with West Coast Solar today!